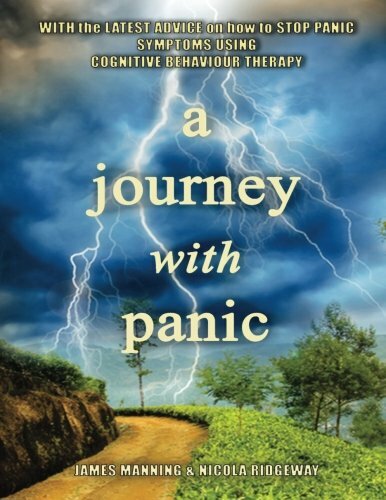 Article first published as Book Review: ‘A Journey with Panic’ by Dr. James Manning & Dr. Nicola Ridgeway on Blogcritics. “A Journey with Panic” by Dr. James Manning and Dr. Nicola Ridgeway is a fact-filled informative read for those who suffer from panic attacks. The authors have included numerous handouts, summaries, and good descriptions of what a panic attack is and what some of the more common symptoms are. As with the other workbooks that Dr. Manning has written, he briefly describes his own journey with mental health issues, which include panic attacks. Sharing his own personal experiences promotes a tendency from readers to trust what he says and accept a majority of the information provided in the workbook. The book describes a panic attack as a whole body response to perceived threat or danger. I found the following statement by the author to be of particular interest: “One of the most confusing issues with panic attacks is that they occur mostly when there is no real physical danger.” There is a great diagram at the beginning of the workbook that shows what happens to the body when we panic (Figure 1). Individuals may experience all or just a few of the symptoms shown. Panic attacks often occur with high stress and anxiety levels. Other chapters by topic in this workbook include Worry and panic, Behavioural avoidance and safety behaviors, and Rules, Beliefs and other therapies for panic attacks. Each chapter is loaded with diagrams, a section for the reader to document their own thoughts, and a summary of key points. Additionally, there is a glossary and a sheet listing common medications at the end of the book. Readers will find this workbook easy to read and understand, as well as find some great information on how panic attacks come about and how one might respond to them the first time. They key to using this workbook is to take one’s time in reading and absorbing the information. In addition, it might be helpful to see a qualified therapist to help with any in-depth questions or concerns. Dr. Manning and Dr. Ridgeway have several Cognitive Behavioral workbooks that cover topics such as Depression, Anxiety Attacks, and Cognitive Behavioral Therapy. “A Journey with Panic” is quite interesting to read as the authors provided quite a bit of information, but it was not so overwhelming one felt as if they couldn’t finish utilizing it.